First phase of the Collecting Social Photography project has ended and fortunately we (the partners in the project) have received funding to continue the work with social photography in archives and museums for another 3 ½ years. More about that in a future blog post. But what have we learnt so far? The main longterm goal of the project is to generate new knowledge and raise awareness among archives and museums in the Nordic countries on the effects of social digital photography on collecting, managing and disseminating of photographic collections. The project has established new connections with important actors in the multidisciplinary field of research on social digital photography and that way already created better understanding of the complex problematics and made it possible to rephrase the initial research questions. It has become evident that in spite of the mass of research already carried out about social digital photography in many fields, there is a lack of projects that address questions related to the memory aspect. Heritage organizations’ and archives long term need to preserve the photographs and the metadata is not discussed. Focus in the previous research has very much emphasized communicative aspects, the social part. We expected that the subject of the project could have an impact on policies and every day routines of working with photograph collections in the Nordic heritage sector in all the Nordic countries. We were right, as it is a new constantly changing multidisciplinary field, where knowledge is much needed; it demands exchange of experiences and results within the Nordic countries. Simultaneously the field is even more complex and more multidisciplinary than we expected in the first phase of the project. We have met appreciation also outside the Nordic countries because the project deals with a field, where few memory institutions have made their own practical and theoretical experiences. This project intends to form the first phase of more phases with an aim to evolve ways to collect social digital photography in museum and archives, which has not been carried out before in a coherent way. In this phase the mapping of knowledge, literature, network building, and preparation of case studies have been the focus. It has prepared all the Nordic participants to continue the development within the field and to continue the work and the pilot studies, as we do not have to start from the beginning knowing each other’s way of working. It has also proved fruitful to discuss possibilities of empirical studies across Sweden, Finland, and Denmark as the countries are so much alike that almost identical themes and methods seem relevant and an inspiration to all. 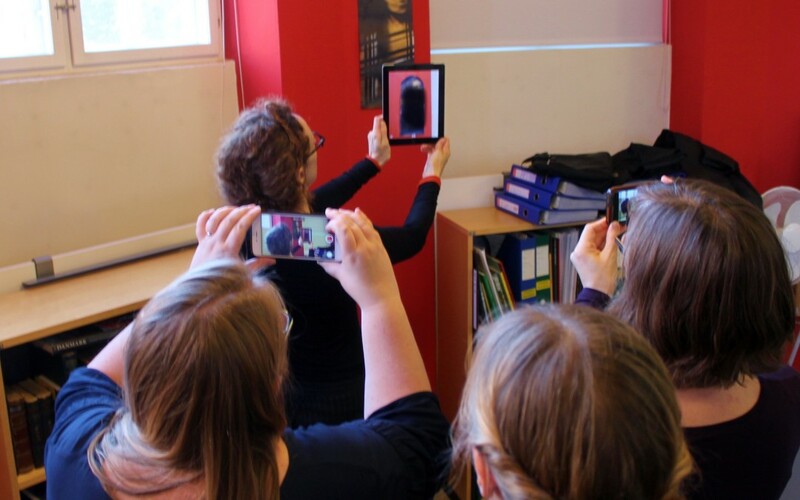 The illustration is from a project meeting at Aalborg City Archives where the project partners learnt about augmented reality from our guest, Susan Kozel from the Living Archives project at Malmö University.